To sum up my monthly spending and budget report for July 2012 in one sentence I'd write... "To say its been a high expenditure month is an under-statement of the year". But I achieved more this month than most months. I think when you have huge once-off expenditure items, you become more careful with your spending in other areas. Remember that this is the month where I got a pleasant surprise of a reduction in levies for one unit, then security fees climbed up in two units, and my mid year goal review showed just how slow my progress is, but I'm not complaining. I spent a lot of money last month. But it was all responsible spending. Plus the interest rates dropped... which is never great news for savers. Real Estate 63% That's higher than I wish, meaning that my other income is too low. Hubby Allowance 32% This is not so necessary but I like it. Extra 4% Interest on my Emergency Fund. Dividends were ZERO again. On the expenditure front: it was my first overspending month for the year. Real Estate 25.1% 1 mortgage & taxes/rates. I am not counting the barrier doors because they were not taken directly from my income. Online 0% I did spend $50 on my online business but I made provision for it from my previous online income. Consumer 1.6% Groceries, personal care and all that jazz .Not realistic, I think most shopping was done by hubby. Giving 44.2% Part of this is an interest free loan to a friend. 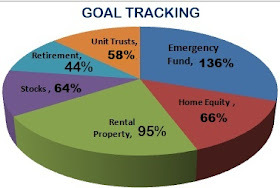 Invested 20.2% Like I mention below, I paid some to my homeloan even before I started spending. I also topped up my Just Invest which serves as my emergency fund account. OVERSPENDING -R2784 I ended in the RED. In reality I overspent by -R20,784 if we take the security costs of that one unit into consideration. But the money was from savings, not my monthly income. My parents were in a tight corner and I helped them out with R9000, there goes my online income from last month. I then topped up my emergency fund by R6000, paid R3000 extra in my homeloan account, paid all municipal accounts until October and paid this quarter school fees for my one and only bursary recipient. I had to take funds elsewhere to pay for the barrier doors (R18000) for the ground floor of my biggest unit. This gave me a negative balance sheet statement with a - R2800 balance. Thats how little I overspent. My online income usually helps with occasional needs of my parents. Interest rate cut means my interest on the emergency fund drops whilst my home-loan installment is in its lowest. I still cant believe how low it is. Since its not profiting me much to save at the moment, I will put all my extra income into my homeloan to fast track bond payment. Its my last home-loan standing. I cant wait to be home loan free.